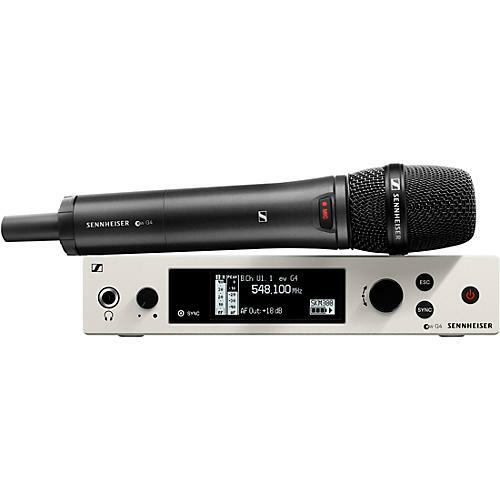 This evolution wireless series comes with Sennheiser’s EM G4 wireless receiver, an SKM 300 handheld transmitter microphone and Sennheiser’s e865-S microphone capsule. It is a multipurpose tool for a wide range of possible applications from education speech and lecture, corporate presentations, live performance or speeches. Thanks to its great sound, reliable RF transmission and robust devices with the right accessories, ew 300 G4 is probably the most flexible wireless microphone system available. You can rely on it in any situation, in any application, in any location. It covers all professional audio demands and suits perfectly for any speech, lecture, conference, moderation or live performance on stage. True diversity half-rack receiver in a full-metal housing with intuitive LCD display for full control with evolution wireless G4 100 Series systems. Get easy and flexible wireless synchronization between transmitter and receiver via infrared on up to 20 compatible channels. The SKM 300 is a powerful handheld transmitter with a lightweight black aluminum housing, increased bandwidth and transmission power, ready to take the world’s biggest live stages. It is built especially for evolution wireless G4 Series systems.